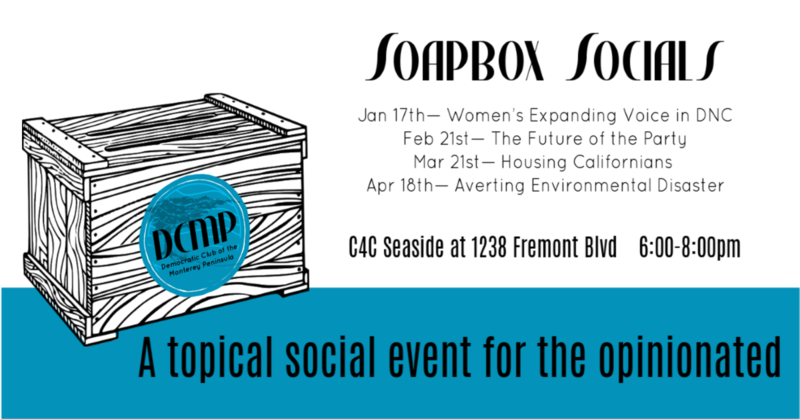 A Topical Social Event for the Opinionated—the Soapbox Social series by the Democratic Club of the Monterey Peninsula features a new topic each month and brings together the most interesting and interested people to discuss, debate, and bond. Come to learn via the guest lecture and then to share your thoughts and solutions during the open mic portion. Make new friends, find new allies, and join us in an old-school celebration of democracy the 3rd Thursday of every month at the Center for Change Seaside.